New York, NY (Feb. 19, 2019) – The Condor has been in development for the past year and is the next generation in DDC’s drone delivery cargo aircraft. With a payload capacity of 180 kilograms or 400 pounds, and a potential travel distance of up to 200 kilometres, the Condor pushes the limits in both cargo capacity and distances. The Condor is powered by a next-generation gas propulsion engine. The Condor measures 22 feet long, 5.1 feet wide and seven feet tall. It has a wing span of approximately 20 feet and is capable of vertical take off and landing. 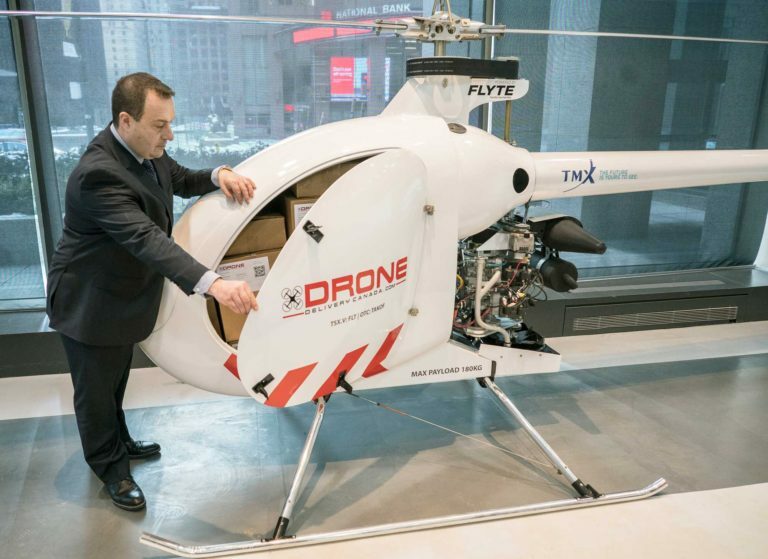 It is equipped with DDC’s proprietary FLYTE management system which is the same platform used in all of DDC’s cargo delivery drones. This is also the same management system that was used in the fall of 2018, during the company’s operations in Moosonee and Moose Factory, Ontario in support of Transport Canada’s Beyond Visual Line-of-Sight (BVLOS) pilot project. To watch the launch VIDEO of the Condor please visit DDC’s video repository.